A new poll commissioned by Bloomberg Politics shows Sen. Bernie Sanders (I-Vt.) drawing support in his presidential campaign from a quarter of likely voters in the Iowa caucuses. His 24 percent showing is a significant jump from a similar poll a month ago, in which 16 percent of Iowans selected Sanders as their first choice. "The polls reflect what we're seeing on the ground," Sanders campaign manager Jeff Weaver tells Seven Days. 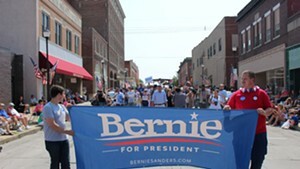 "The more people hear Bernie Sanders' message, the more people will come to him. We are contesting these states aggressively and the results are showing." They’re showing in more ways than one. A super PAC affiliated with former Maryland governor Martin O’Malley on Thursday released what appears to be the first negative advertisement aimed at Sanders’ presidential campaign. Citing the Vermonter’s mixed record on firearms legislation, the ad’s narrator says, “Bernie Sanders is no progressive when it comes to guns.” A separate 15-second ad released Thursday by the super PAC, Generation Forward, touts O’Malley’s support for gun control. The Bloomberg poll, conducted by Selzer & Company, indicates that former secretary of state Hillary Clinton remains in a dominant position in the Hawkeye State, though her support has softened slightly. She drew 50 percent in this month's survey, compared to 57 percent last month. O'Malley and former Rhode Island governor Lincoln Chafee barely registered. Conducted by Selzer & Company, the poll drew from telephone interviews with 401 likely caucus-goers. Its margin of error was plus or minus 4.9 percentage points. When a pair of polls released last week showed Sanders taking more than 30 percent of the vote in New Hampshire, some pundits suggested his success in the Granite State was the result of its close proximity to Sanders' home base of Vermont. Thursday's Bloomberg poll "quite clearly refutes that," Weaver says. Perhaps most promising for Sanders: He remains unknown to many Iowans, which means he has room to grow in the polls. Nearly 40 percent of respondents said they weren't sure whether they viewed him favorably or unfavorably, compared to just 2 percent for Clinton. Sanders’ campaign announced he’ll return to Iowa next week for a three-day trip around the Independence Day holiday. Asked which candidate would "take on Wall Street and financial elites," 48 percent answered Sanders, while 30 percent said Clinton. More voters found Sanders "authentic" than they did Clinton: 47 to 30 percent. But when asked who could "beat the Republican nominee in the general election," Clinton walloped Sanders 72 to 12 percent. Even more respondents — 84 to 3 percent — said Clinton had more "foreign policy experience to navigate a dangerous world" than did Sanders. Bloomberg also released a new poll of New Hampshire voters conducted by Purple State Strategies. That telephone survey of 400 registered voters showed Clinton leading Sanders 56 to 24 percent in the Granite State. That's a six point gain for Sanders since last month and a six point drop for Clinton. The New Hampshire poll's margin of error was also plus or minus 4.9 percentage points. Read Bloomberg's story here. See the full results of its Iowa poll here and of its New Hampshire poll here.